Once again, my work took me to a place no one heard or visited before. 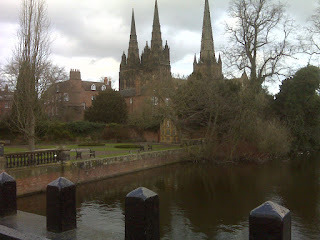 According to Wikipedia, Lichfield is a “city of the dead” where thousand Christians were martyred around AD 300, but today it is a gem of the midlands: the city has a very relaxing vibe, with quite young population (at least, that was my impression), beautiful cathedral, clean streets and numerous restaurants to please every taste. I have stayed at the George Best Western hotel which has its own pub and carvery restaurant, but during my stay I have tried couple of places on the high street (including the amazing “The Thai Rainbow”). For shoppers, there is a Friarsgate centre as well as traditional market. The high street is full of boutique shops and big chains. As for transportation, there is a direct train link from London Euston, or 25-30 minutes from Birmingham. Definitely will come back to relax for a weekend.